Abstract. One of the great challenges in glaciology is the ability to estimate the bulk ice anisotropy in ice sheets and glaciers, which is needed to improve our understanding of ice-sheet dynamics. We investigate the effect of crystal anisotropy on seismic velocities in glacier ice and revisit the framework which is based on fabric eigenvalues to derive approximate seismic velocities by exploiting the assumed symmetry. In contrast to previous studies, we calculate the seismic velocities using the exact c axis angles describing the orientations of the crystal ensemble in an ice-core sample. We apply this approach to fabric data sets from an alpine and a polar ice core. Our results provide a quantitative evaluation of the earlier approximative eigenvalue framework. For near-vertical incidence our results differ by up to 135ms−1 for P-wave and 200ms−1 for S-wave velocity compared to the earlier framework (estimated 1% difference in average P-wave velocity at the bedrock for the short alpine ice core). We quantify the influence of shear-wave splitting at the bedrock as 45ms−1 for the alpine ice core and 59ms−1 for the polar ice core. At non-vertical incidence we obtain differences of up to 185ms−1 for P-wave and 280ms−1 for S-wave velocities. Additionally, our findings highlight the variation in seismic velocity at non-vertical incidence as a function of the horizontal azimuth of the seismic plane, which can be significant for non-symmetric orientation distributions and results in a strong azimuth-dependent shear-wave splitting of max. 281ms−1 at some depths. 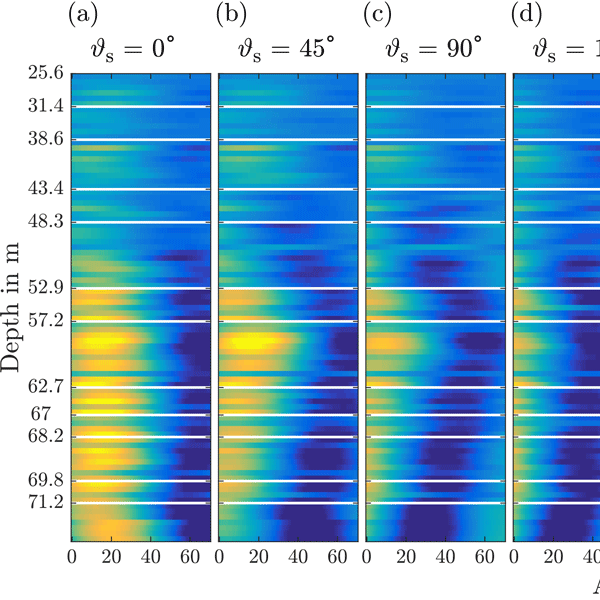 For a given incidence angle and depth we estimated changes in phase velocity of almost 200ms−1 for P wave and more than 200ms−1 for S wave and shear-wave splitting under a rotating seismic plane. We assess for the first time the change in seismic anisotropy that can be expected on a short spatial (vertical) scale in a glacier due to strong variability in crystal-orientation fabric (±50ms−1 per 10cm). Our investigation of seismic anisotropy based on ice-core data contributes to advancing the interpretation of seismic data, with respect to extracting bulk information about crystal anisotropy, without having to drill an ice core and with special regard to future applications employing ultrasonic sounding. How to cite: Kerch, J., Diez, A., Weikusat, I., and Eisen, O.: Deriving micro- to macro-scale seismic velocities from ice-core c axis orientations, The Cryosphere, 12, 1715-1734, https://doi.org/10.5194/tc-12-1715-2018, 2018. We investigate the effect of crystal anisotropy on seismic velocities in glacier ice by calculating seismic phase velocities using the exact c axis angles to describe the crystal orientations in ice-core samples for an alpine and a polar ice core. Our results provide uncertainty estimates for earlier established approximative calculations. Additionally, our findings highlight the variation in seismic velocity at non-vertical incidence as a function of the horizontal azimuth of the seismic plane.